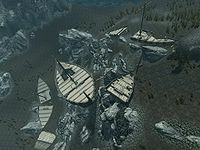 Pilgrim's Trench is a ship graveyard not far off of the northern coast of Skyrim. This location is actually deep under water. It consists of four shipwrecks which lie on the bottom of the sea. The trench is only marked as discovered if you dive down to the ships. The main ship (the one that isn't broken in two) has two chests containing minor loot. The first is just inside on the top deck beside all the rest of the furniture. The second chest is on the lower deck along with five barrels that contain food, a dresser and wardrobe both containing clothes. There are no underwater predators nearby, just an abundance of salmon and at least eleven Nordic barnacles at this location. Most of the barnacles are on the main ship, both inside and outside, some of them are on the ceilings inside. It is a long dive. All races except Argonians will need a waterbreathing effect to explore this location. Explorers should allow 60 seconds of waterbreathing for a quick dive and three minutes for a leisurely perusal of the site. You may learn what happened to the ships if you manage to summon Velehk Sain in the Midden. He is dressed like a sailor and tells you that while he was in Mundus he used to be a pirate. He offers to give you some items he obtained during that time, and he mentions that he and his companions sunk some Imperial ships. The treasure is magically hidden close to Pilgrim's Trench, on an island that has a statue of Talos. There are two shrines of Talos nearby, one to the southeast on an island and the other due south, past the unmarked camp, on the mainland. The second shrine of Talos is to the south, due east of Hob's Fall Cave. At the feet of the statue of Talos is a random greatsword, a steel shield, a pair of random boots, a medium coin purse, a potion of the defender and a copy of the Two-handed skill book Words and Philosophy. This page was last modified on 3 March 2017, at 21:05.